Home / Welcome to Our New Website! 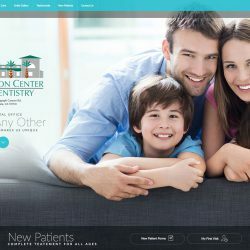 We are excited to welcome you to the brand new website for Thompson Center for Dentistry! Our cosmetic dentist, Dr. Uyen Thompson, and her experienced team of dental professionals offer you this state-of-the-art virtual window into our practice so you can get a detailed glimpse of what you can expect during your visit with us. As you peruse through the site, you will find descriptions of the comprehensive dental care options we provide, including an array of procedures designed to enhance the health, function, and appearance of your teeth and gums. You can also view a detailed biography of Dr. Thompson and learn about the many aspects of our practice that make us a unique choice in the Chula Vista and San Diego area. Dr. Thompson and her team welcome patients of all ages to our practice, and we treat each and every individual like we would treat a guest in our home. We are committed to providing you with the latest techniques, effective treatment, compassionate care, and an experience that is as comfortable and pleasant as possible. If you would like to schedule an appointment here at Thompson Center for Dentistry, please don’t hesitate to contact us today. We look forward to helping you renew your smile!